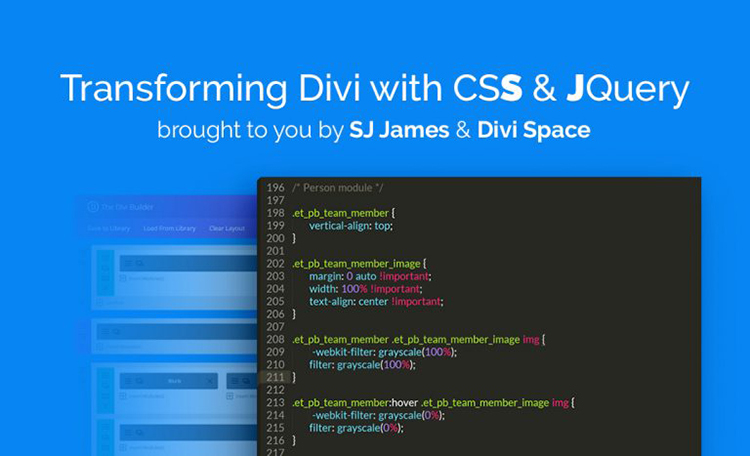 The Divi Space Transforming Divi with CSS and jQuery course will teach you everything you need to know about building a successful website with Divi. Covering all of the bases, the course will show you how to use fundamental web design principles to create beautiful and highly functional websites with Divi. With the knowledge gained in the course, you’ll be able to transform a standard, good looking website into a striking and powerful online solution. Stephen James is a UK based web developer whose name is synonymous with Divi. An early adopter of ‘Divi as a framework’, his easy to follow tutorials and Divi extensions have saved thousands of designers from hours of pain. A deep dive into the standard customisation options available in Divi, including: Theme and Module Customizer, Divi Theme Option (Custom CSS & Integration Tab) and inline editing options (front end editor). Taking a peak at the HTML & CSS buildup of the Divi frontend. How to use inspect element, console and other baked in tools to improve development. An intro to must have browser extensions. How cascading works, how to override CSS and best practises for clean, well written code. What they are, why they’re awesome and usercases for how to make them work in your designs (icons, separators etc). How they work, why we use them, best practises for mobile responsiveness. How to utilise Divi’s breakpoints for fluid design. How to build your own animation, how to hack into Divi’s animations and where to find new ones. When CSS simply doesn’t work, how do you fix it? Troubleshooting common issues including broken CSS, caching and overriding CSS. A tour of five real sites that use CSS well. 10 prebuilt lines of Jquery that can be used in a function to create stunning effects. How to build a proper Jquery function including how to specify when and where it runs. Three common issues in modules and static pages, solved with Jquery. How to Move a div somewhere else, how to replace the contents inside a div with something else and how to create a wrapper around content (putting comments box into a toggle for example). Building a child theme template that correctly adds CSS & Jquery. Walkthrough of using what we’ve learned to create the ET home page. This course has helped me understand how to think in code. (Simple code, I'm no coding genius). Solving web design problems seems like magic when you know how to locate what you want to change (the element), and then how to write the code to target that specific element and this happened for me in the very first lesson. SJ is a great instructor; easy to follow, explaining concepts in a way that creates interest and excitement about the possibilities. Whether you completely understand CSS and jQuery or your a newbie like me, you'll quickly learn how easily it is to make changes that up until now you've spent hours searching the web for answers. Want to move a logo? Change a background color? There are hundreds of tutorials and guides, some up-to-date, some not -- and learning to find answers is a big part of learning to design web sites but here you've got the benefit of SJ's expertise, the Facebook group for sharing questions and ideas, and the entire Elegant Themes community. Best decision I ever made. I am a developer that uses Divi almost exclusively. Sometimes when I come across courses like this they are usually so simple that I get nothing out of them. The reason I like this one so far is that yes the content may be things I know or have used before but the explanation and the way it's taught makes me want to come back and refresh what I know. That's not to say that I haven't learned new things because I have. I usually hang out on the ET support forum and help people with issues and I love doing it in my free time but people that are willing to learn will find that the way SJ teaches them how to use inspect element for example and debugging errors etc will probably lead to even DIYers not needing as much help. My point is either way you can learn a lot. Everyone should just take this course in my humble opinion. I was disappointed to firstly not be able to access the course. Then to learn I can not complete it at my own space. The course it appears is only released in stages and I have to wait a week to get to the actual training bit rather than the introduction to... Wha tI have managed to get on to so far has been good and well presented but there are so many thing tripping me up along the way. I seem to be wasting a lot of time contacting support. Enroll in one of the Divi Space web design or online marketing courses today gain all of the necessary skills to become a sought-after web developer. Start building your dream Divi business with Divi Space, where we learn better, together.